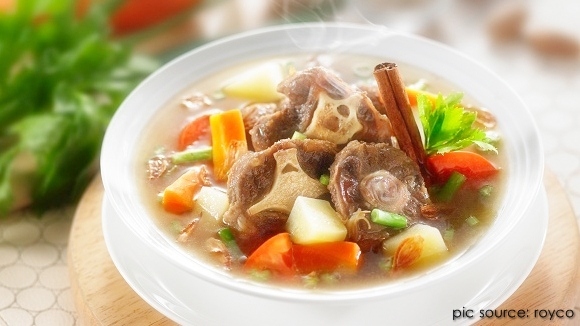 One of soup dishes that are very popular in Indonesia is oxtail soup. This soup was one of indonesian food that adore by many people. Savory broth with oxtail meat were delicious certainly for your family tastes. Oxtail soup were so popular even one brand of instant noodle made a series of their products adopting the taste of oxtail soup. Saute canola oil, onion, garlic, lime leaves, leeks, celery, cinnamon, and nutmeg until fragrant. Add oxtail, salt, sugar, pepper, and mix well. Set aside. Insert pieces of carrots and potatoes into boiling water and cook for 15 minutes until cooked. Enter oxtail stir into the broth, cook until done. Serve with chunks of fresh tomatoes and other ingredients.